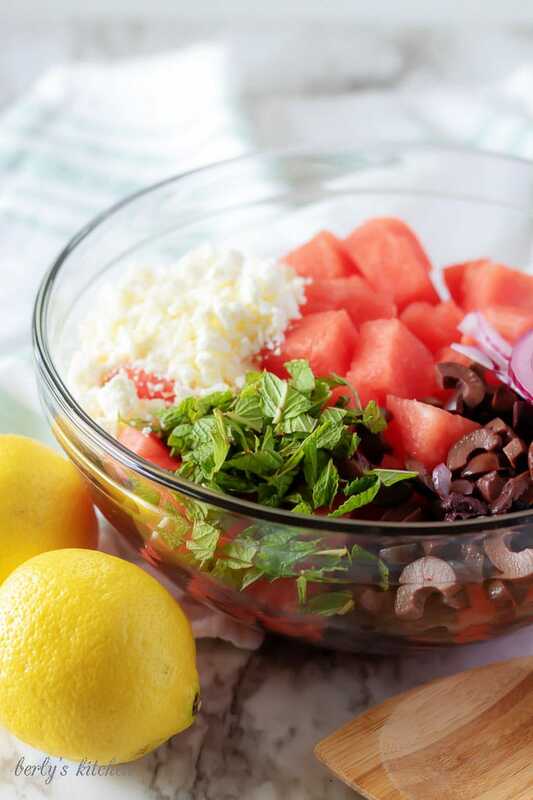 Looking for an easy watermelon salad? Then search no more, our savory, sweet side dish has only three steps while still using the freshest of ingredients. Over the last seven days we’ve done a lot of outdoor grilling. Quite literally, pounds and pounds of beef and chicken have found their onto our propane and charcoal grills. Needless to say, Kim and I have been dying for light, Summer salad. Yesterday, she came home from the store with a ripe watermelon tucked under her. I knew that could mean only one thing, watermelon salad. After unloading the bags we got to work preparing one the easiest and freshest salads to ever grace our blog. We can’t wait to share it with you. 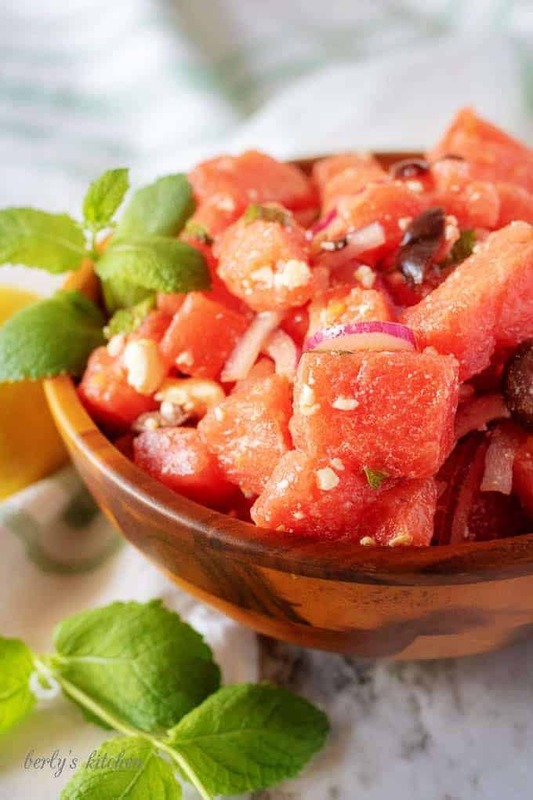 First, start by dicing your watermelon into bite-sized cubes, thinly slice your red onion, chop or slice your Kalamata olives, and roughly chop the fresh mint. Set them all inside a large mixing along with the feta cheese crumbles. If your grocer offers any of these items pre-cut in our produce section, then I say go for it, save yourself the extra time. Next, in medium mixing bowl with a whisk, combine the lemon juice, olive oil, and lemon zest. Whisk everything together vigorously to create a simple vinaigrette. It’s important to note that you try all sorts of flavored salad dressings by combining equal parts olive to different fruit juices (acids) and/or vinegars (Balsamic, Apple-Cider, etc). Last, pour the dressing over the watermelon in the large mixing and give the salad a quick toss to coat all the ingredients before serving. Sprinkle the dish with salt and pepper to taste. My only word of caution is in regards to storage, the lemon juice does a number on the delicate watermelon flesh. So, if your making this dish in advance, I wouldn’t add the dressing until your ready to serve the salad. If you have a small mason jar and lid, try mixing your dressing in that instead of the mixing bowl. Simply combine all the ingredients, seal it with the lid, and have a nice long shake session. When picking a watermelon, I try to use my sense of smell. Does it smell sweet? If so, you’re probably good, if not choose a different one. For a sweeter watermelon salad, try substituting balsamic vinegar for the lemon juice. Don’t forget about our other great salads, like this Cold Pasta Salad or our Spring Salad with a Citrus Vinaigrette! 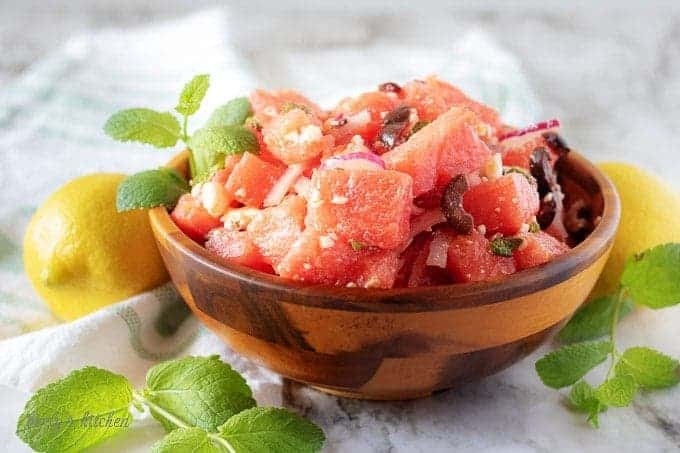 First, start by dicing your watermelon into bite-sized cubes, thinly slice your red onion, chop or slice your Kalamata olives, and roughly chop the fresh mint. Set them all inside a large mixing along with the feta cheese crumbles. Next, in medium mixing bowl with a whisk, combine the lemon juice, olive oil, and lemon zest. Whisk everything together vigorously to create a simple vinaigrette. Last, pour the dressing over the watermelon in the large mixing and give the salad a quick toss to coat all the ingredients before serving. Sprinkle with salt and pepper to taste. The calories listed are an approximation based on the ingredients and does not reflect any substitutions or additional garnishments. Salad can be stored in your fridge for up to 2-days in a sealed container. So obsessed with watermelon right now! I still haven’t tried it in a salad, but I think I would love it. This looks so yummy! Thank you, Christine! I had never tried one either, so I was pleasantly surprised that I liked it. We hope you give it a try sometime. Looks good! I’ve never actually had a watermelon salad before although I’ve seen them. I think now’s a good time to try since my husband buys a watermelon at least once a week. Thank you, Carissa! I had never tried one either and didn’t think I would enjoy the salad. Turns out, I was wrong and actually liked it. We hope you give it a try sometime. What a refreshing summer salad. I would be tempted to add a protein and call this dinner. Perfect for hot summer eating…no need to heat up the kitchen. 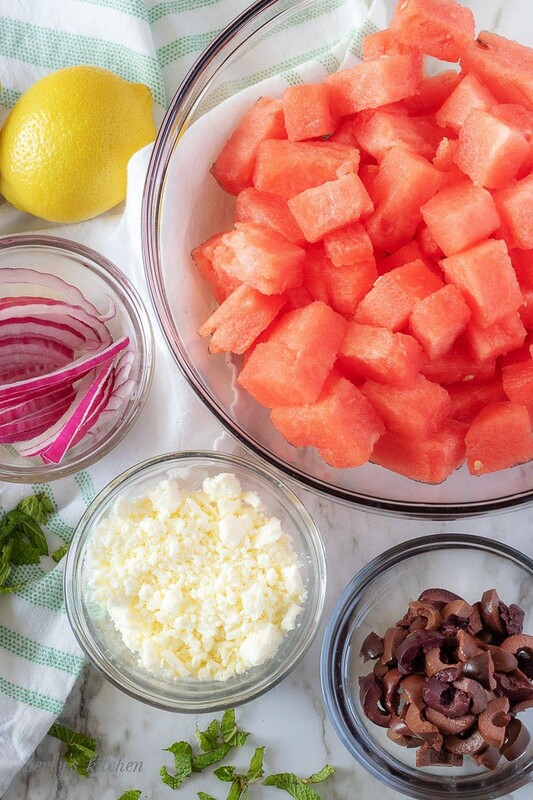 This watermelon salad is the perfect summer accompaniment to any bbq meat. Its refreshing flavors soothe the palate and leave you with a wonderful aftertaste. Lovely colors as well! 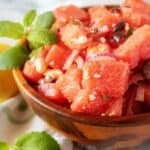 I make many recipes in Summer with Watermelon and salad is on my list.This looks refreshing and sounds so good! 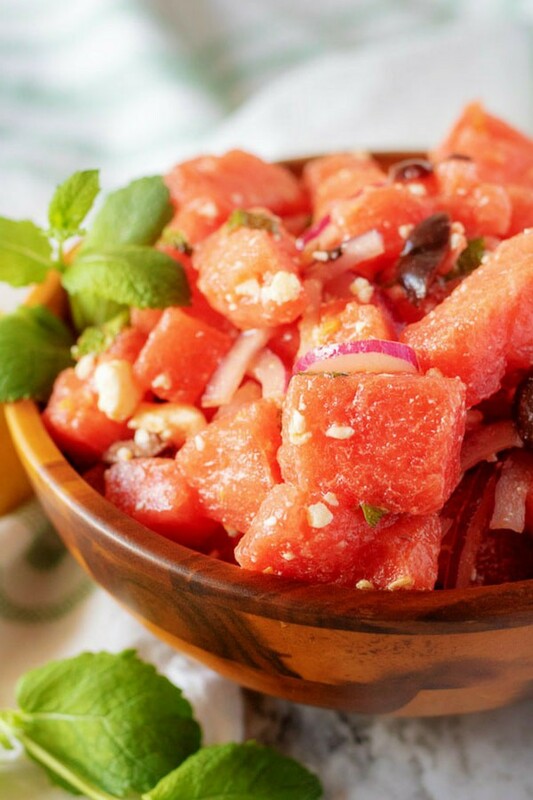 Watermelon salad makes such a great side dish at summer BBQs. And it makes a great light lunch too! We’ve been getting the BEST watermelon lately. I’ve never tried using it for a savory salad but this sounds amazing. Going to try it out ASAP! This looks perfect for a summer lunch or dinner. I love watermelon! Adding it to salad sounds super refreshing and tasty! 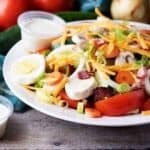 I had something similar to this salad at a party recently and have been craving it ever since. Now I can make it on my own! Oh my goodness this salad looks amazing!! I love a good fruit type salad and this is right up my alley!! I love these ingredients….so unique! I can’t wait to try this! Perfect for summer! Give me watermelon and I’m one happy girl. Watermelon, feta and mint leaves salad- i’m in heaven! What can be better than this on a hot summer day!